Las Vegas Cyclery Fitting Center located upstairs in our Green Energy Shop In Summerlin. 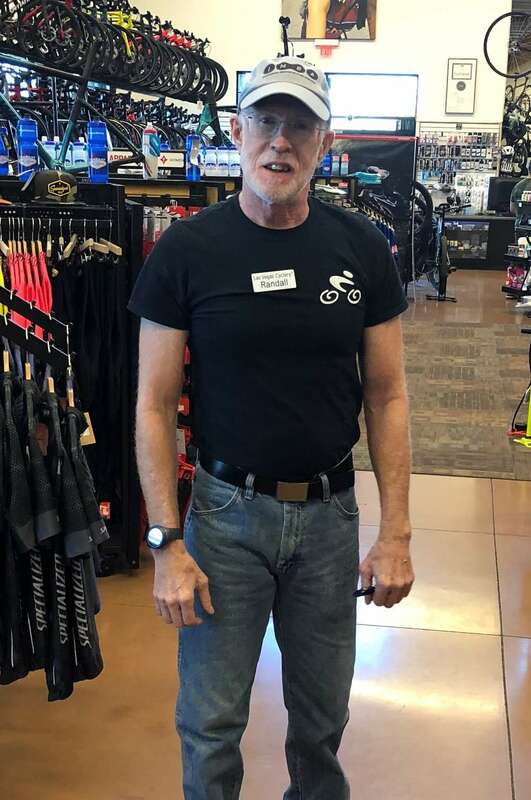 Our bike fitters followed the work of Dr. Andy Pruitt Ed.D., PA of the Boulder Center for Sports Medicine and found only at your local Specialized dealer. It's a comprehensive fit philosophy created to help cyclists ride faster, longer and in greater comfort, while reducing the chance for injury. We are now partner with Las Vegas Bike Fit! Greg Choat for high end Computarized Lazer fitting and custom order Insoles. Check out the Las Vegas Bike Fit website here to book your appointment. It's located right by the Shop at the Trail Retail Center across our parking lot. Steve Clausse, Fitter at Las Vegas Cyclery - Randall Fox, certified fitter. Determines proper size and style of bike which will best fit your style of riding and physical attributes. Included with new bicycle purchase. This service determines proper placement of cleat on shoes and a neutral cleat placement that allows you to optimize the full range of your pedal/shoe systems adjustments. Included with new shoe purchase! Time allotment: Allow 10 minutes for this appointment. Book and Appointment Now. Click Here.